Everything around me is very unique and I am going to try and use this platform to share my experiences with anything and everything in regards to food,household tips et al....please read and comment when possible...enjoy!! Wheat Laddoo / Gothambu Laddoo - Festive Dish!! Heat ghee in a thick-bottom pan. Add Besan and wait until it appears frothy. Now add wheat flour and stir on medium high flame. This will require continuous stirring until the flour it roasted well and gives a cookie-like aroma. Now add powdered sugar, cardamom and cashew and mix well. Now form lime-size balls out of the mixture and serve with raisins decorated on top. Its a very delicious and yummy treat , loved by all, and easy to prepare for any festive occasion. Once mustard seeds crack, add dry red chillies,fenugreek powder,fenugreek seeds,asafoetida powder and stir well. Then add green chillies,curry leaves and saute till the raw smell is gone. Now add red chilli powder and stir well. Remove from flame and set aside to cool. After around an hour or so , when the above mixture has cooled down, add the lemon pieces,salt and vinegar and mix well. Later store in an airtight container. Naranga Curry is now ready to be served with warm rice and curry like Sambhar or with plain and simple 'Curd Rice'. In a cooking vessel add mango , salt, turmeric powder, fenugreek powder,green chillies ( save one for later use)and curry leaves and water. Make sure mango is just immersed in the water. Bring this to boil and cook until mango is nice and tender. In the mean while grind the shredded coconut , remaining green chili and cumin seeds to a fine paste. Add water just enough to grind to a fine paste. Once mango is cooked add this paste to it and simmer. For garnishing , heat oil in a pan ,add red whole chillies and mustard. Once the mustard splutters,add this to the simmering mango curry. 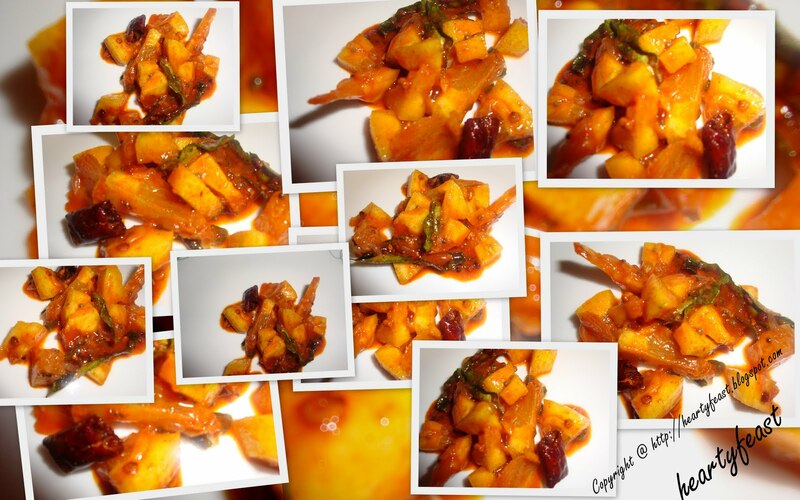 Mango curry is now ready to be served with steamed rice and Kappa Mezhkupuratti. My entry for National Mango Board contest from Foodie Blogroll. Cut chicken into bite-size cubes. Now add corn flour,black pepper,ginger and garlic paste,salt to taste , and egg to the chicken.Mix well and set aside for 30 mins. In a pan , heat 3 tbsp oil. Now add marinated chicken one-piece-at-a-time to this oil. Fry in medium heat until chicken pieces are brown in color.Remove from heat and serve hot. Chicken Nuggets are now ready to be served with ketchup, ranch, or home-made chutney. Aviyal - Simple and Easy !!! Grind coconut , green chillies(2 nos),cumin seeds to paste. Use just enough water to grind. Do not use too much water. In a cooking vessel add the vegetables - plantains,raw mango,carrot,beans; along with turmeric powder, salt, curry leaves,green chillies (remaining) and red whole chillies. Add just enough water to immerse the vegetables.Bring this to a boil and cook till plantains are tender. Now add the coconut paste and oil to the cooked vegetables and simmer for few minutes.Make sure the water in the vessel is reducing. Do a taste test and add more salt if necessary. Turn off the heat once water/gravy is reduced completely. Avial is now ready to be served with steamed rice and Sambhar. Vegetable Manchurian - I tried!!!! I tried!!!! Happy Birthday Indulge—we turn Nine! GayathriRaj - Heaven on a Spoon!!! Mung Dhall Kadhi - What To Cook?? Copyright @ http://heartyfeast.blogspot.com. Picture Window theme. Powered by Blogger.